You can’t move at the moment for High Definition cosmetics. I’m not – entirely – convinced that for day-to-day wear you need cosmetics that provide coverage designed for such a specific purpose (essentially a High Definition cosmetic is one designed not to look dreadful for digital photography), but some of them do have their uses. I’m a fan of HD powders, they’re a lot finer than traditional talc-based powder, and for that reason, on my slightly dry skin, I find them quite easy to wear. They’re also slightly lighter than talc-based cosmetics, so they won’t clog your pores, and they’re also suitable for summer-wear over a tinted moisturiser. Mainly consisting of silica, this powder costs £6 and is available from the ELF website. It’s housed in a bulky black box with a sifter, and comes complete with a velvet puff to buff the product into your skin. This is housed in a round container, which has a built-in applicator, which makes it slightly less likely that you’ll end up spilling the powder all over your feet when you’re using it. Not, of course, that I’m speaking from experience! 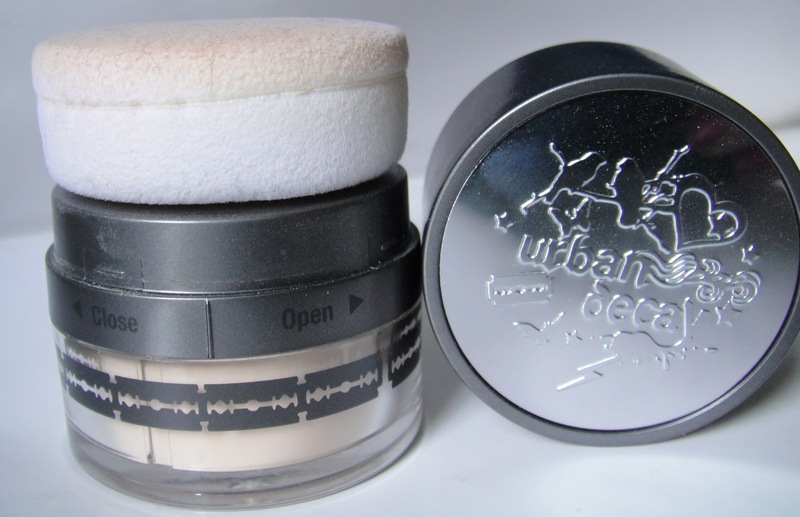 Their are two major differences between the Urban Decay HD powder (seriously, I cannot be bothered typing the full name out every time) and the ELF, and that is the UD is beige, and it costs £17. So, given that the major component in both powders is silica, is there much difference between them? Actually, yes. And no. Both feel silky on the skin thanks to the silica, and both work well as finishing powders, giving the skin a matte-ish, but not flat finish. In fact, the ELF powder is the one I use as a finishing powder in the vast majority of my makeovers, but I do find that the Urban Decay does, in fact give a finer, softer finish on the skin, and feels a great deal silkier when rubbed between your fingertips. There’s not a huge amount to choose between them to be honest. Both involve patting the applicator over your skin, then I like to sweep away the excess with a large powder brush, to give an even finish. Do you own any HD cosmetics, what do you think of them? The Fine Print: I bought these. A little while ago, admittedly, but I’ve still got the box the ELF came in. I really need to tidy up. 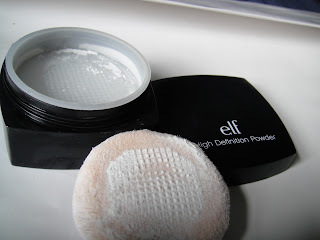 I love this elf HD powder, it makes my skin amazingly smooth. However the packaging is a bit annoying – it goes everywhere when you open it! I tried putting pin holes in the plastic sticker over the holes, but it didn't really work out! I have both of these finishing powders too. I prefer the ELF one for mattifying, but the Urban Decay powder feels nicer to use because it's so much silkier and softer. If I'm wearing a mattifying primer or foundation, I like to use the Urban Decay HD powder, but otherwise the ELF for all-day shine control. I hate the Urban Decay packaging though – so, so bad!! I ripped off the sponge head and decanted the powder into an empty ELF container. I don't mind the Urban Decay packaging, but it does mean that only one person can use it! It does feel lovely on the skin though. ELF definitely won this one for me, the price certainly wins out! I have the smashbox high definition powder, got it form ebay for £7 because the use by date is April 2011 but powders don't go off until another 7 months after their use by date. Well, I think the smashbox is a bit tiny for the price, it has a brush on top and is really hard to get the powder out of the top. I've tried to order ELF's HD powder but it runs out as soon as it is restocked lol.